Peter Roskam says Dan Shapiro's 'troubling' remarks will only serve to 'empower' those who seek to 'delegitimize and marginalize' Israel. 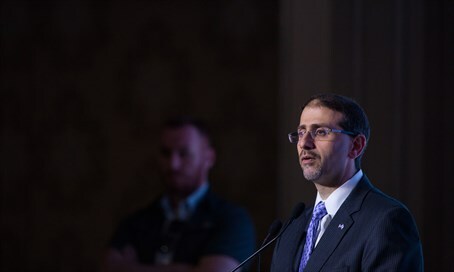 Several days after US Ambassador to Israel Dan Shapiro ignited a diplomatic firestorm with his criticism of Israel, US Congressman Peter Roskam (R-IL) sent a letter to Secretary of State John Kerry urging him to adamantly reject the envoy's statements. In his remarks before the Institute for National Security Studies conference on Monday, Shapiro blasted Israel's policy on "settlements," openly casting doubt on the Jewish state's to desire to achieve peace with the Palestinians. According to Roskam, these "troubling" remarks not only "do not reflect reality," but also serve to "empower those who wish to delegitimize and marginalize the Jewish State." Roskam noted that Shapiro made the statements on the same day terror victim Dafna Meir was buried - and as Shapiro was "wrongly castigating Israel on the world stage," Palestinian leaders were "unabashedly praising Dafna's killers." "Perpetuating falsities and and placing undue and disproportionate blame on Israel for the stalled peace process is a harmful distraction from ongoing Palestinian terrorist attacks, which, ultimately, make peace harder to achieve," Roskam blasted. Listing numerous times since its founding that Israel had offered concessions for peace, Roskam asserted it was a "robust US-Israel relationship" that provided Israeli leaders the "confidence" to make such sacrifices. "Now more than ever, the United States must unequivocally stand with Israel, our strongest ally in the Middle East," he continued, adding that displays like Shapiro's only served to weaken that relationship and "inhibit peace efforts." "Ambassador Shapiro's troubling remarks are counterproductive and wrong," he concluded. "I encourage you to reject these misguided comments and reaffirm our unbreakable support for Israel."